Interior Minister Sar Kheng and his visiting Vietnamese counterpart, Tran Dai Quang, inaugurated a $2.2-million police academy in Kompong Speu province on Saturday constructed with Vietnamese funds, according to the website of the National Police. The Information Ministry on Sunday issued a final warning to television and radio stations that have continued to flout a ban on broadcasting alcohol advertisements during prime time, saying they risk having their licenses suspended or even revoked. The government will raise the salaries of commune and village officials before January 31, according to a sub-decree dated December 31 and obtained Friday. A 56-year-old former police officer has taken his grievance with a municipal court judge over a decision to approve a signboard obscuring his view of Phnom Penh’s Monivong Boulevard to the country’s highest judicial body. The Interior Ministry has invited representatives of the Khmer People Power Movement, a group Prime Minister Hun Sen has branded a terrorist organization bent on his violent overthrow, to answer questions today about its hopes of forming a political party. Defense Ministry official Thong Sarath, who has been on the run since he was charged earlier this month with organizing the assassination of a prominent Phnom Penh businessman, has been placed on Interpol’s red notice list of most wanted criminals. Police in Ratanakkiri province say they are attempting to locate a group of Montagnards who local villagers say crossed the border from Vietnam last week and are hiding in the forest. A sophisticated timber-smuggling racket that illegally exported more than 300,000 cubic meters of luxury timber from Cambodia into Vietnam has drawn the attention of the highest echelons of government. When Huot Sarom was forced to watch last month as authorities seized rice paddies she has been farming since 1979, it would have been easy to assume her 15-year battle to retain the land was finally at an end. A lawyer at the Khmer Rouge tribunal is the latest person to become embroiled in a land dispute in Pur Senchey district between an elderly woman and Prime Minister Hun Sen’s cousin, Dy Proem. An 11-year-old boy was killed and four other people were injured in a grenade attack carried out by two men on a motorbike Thursday evening in Phnom Penh’s Sen Sok district, police said. 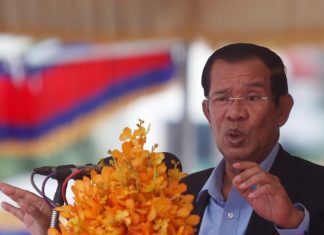 In a 2012 letter to Prime Minister Hun Sen, then-Banteay Meanchey Governor Oung Oeun wrote that a trio of provincial officials had colluded to “illegally” confiscate hundreds of thousands of dollars worth of machinery belonging to a British businessman's company, International Green Energy. Pen Siman, director-general of the department of customs and excise at the Ministry of Finance, will retire this month and be replaced by his deputy, Kun Nhim, according to a Royal Decree dated Monday and signed by King Norodom Sihamoni. Impoverished residents of Prek Toal Village in Preah Sihanouk province are hoping to find work at a slaughterhouse under construction nearby, which is being built to Australian standards after its government agreed to send 10,000 head of cattle here beginning later this year. Anti-corruption czar Om Yentieng on Wednesday applauded high school teachers for overseeing the nation’s cleanest-ever national exam earlier this month, but warned that jail time awaited anyone who is found to be corrupt at the second round of exams in October. At the behest of the Education Ministry—led by Hang Chuon Naron, a newly appointed reformist minister who earned an economics master’s degree in Moscow—the ACU stationed officials at each of the 154 exam centers across the country and enlisted and trained more than 2,000 volunteer exam monitors. Initial hearings opened Wednesday in the second phase of the trial against two of the most senior surviving leaders of the Khmer Rouge, Nuon Chea and Khieu Samphan, who are being tried on charges ranging from genocide to forced labor and other crimes against humanity.